Red meat offers solid nutritional benefits: It's high in quality protein and a good source of vitamin B-12, iron and zinc. On the other hand, it's high in saturated fat and cholesterol. You can limit unhealthy fats by choosing lean cuts of meat, but that doesn't help other health concerns. When red meat is cooked to a high temperature, it produces substances that increase your risk of some types of cancer. Red meat contains enough saturated fat and cholesterol that you'll need to watch portions and make sure that the total amount in your diet stays within the recommended daily intakes. Check the nutrition label on the meat you buy because fat content varies depending on the type and cut of meat. Various cuts of beef, veal, pork and lamb contain 65 to 130 milligrams of cholesterol in a 3-ounce serving, according to the U.S. Department of Agriculture. Saturated fat ranges from 1 to 10 grams. The American Heart Association recommends keeping your daily cholesterol to less than 300 milligrams. No more than 7 percent of your total daily calories should come from saturated fats. When red meat is cooked at high temperatures, such as grilling and pan-frying, two cancer-causing substances are produced: heterocyclic amines, or HCAs, and polycyclic aromatic hydrocarbons, or PAHs. A study published in the January 2008 issue of "Cancer Epidemiology, Biomarkers and Prevention" concluded that consuming red meat that was well and very well done significantly increased the risk of prostate cancer. Another study found that HCAs and PAHs from red meat may also increase the risk of developing colon cancer, according to the October 2013 issue of "Nutrition and Cancer." Unprocessed red meat is not associated with an increased risk for coronary heart disease or diabetes, according to a review published in the May 2010 issue of "Circulation." People who ate red meat eight times weekly did not have a higher incidence of either disease than those who ate meat once a week or less. However, processed meats contribute to both diseases. Every daily serving of processed meat increased the risk of heart disease by 42 percent and the risk of diabetes by 19 percent, according to Harvard Health Publications. 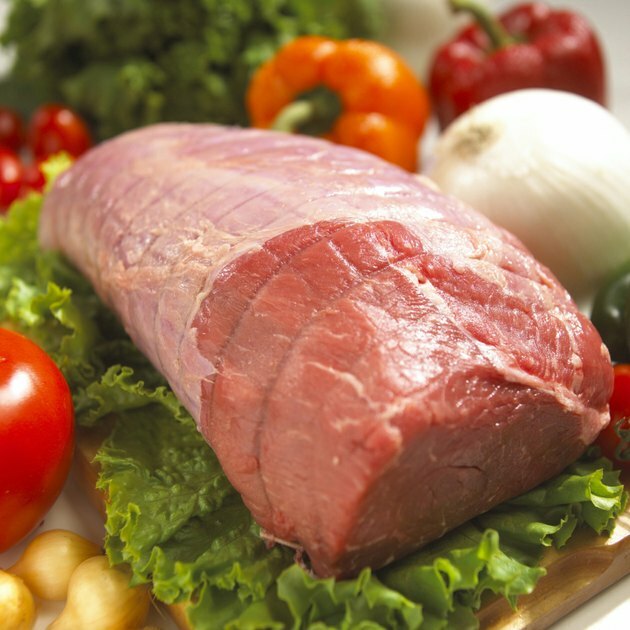 Any meat that contains preservatives or is preserved by smoking, curing or salting is processed meat. A few examples include hot dogs, bacon, sausage and luncheon meats. The American Institute for Cancer Research recommends avoiding processed meat and limiting your consumption of red meat to no more than 18 ounces weekly. Based on a 3-ounce serving size, that works out to 6 servings of red meat weekly. Other recommendations are more conservative. The U.S. Department of Agriculture's Food Patterns suggests 1.8 ounces of meat daily, or 12.6 ounces weekly, based on a 2,000-calorie-a-day diet. The Dietary Approaches to Stop Hypertension, or DASH diet, recommends 1.4 ounces of meat daily, or 9.8 ounces weekly. The DASH recommendation is also based on consuming 2,000 calories daily.